Editor’s note: Tony Dwyer, U.S. portfolio strategist for Canaccord Genuity, and his colleagues author a widely respected monthly overview of market conditions, technical factors, and future market outlook called the “Strategy Picture Book.” The following provides an excerpt from their Oct. 9, 2018, report on the macro market outlook. Inversion of the yield curve (YC). 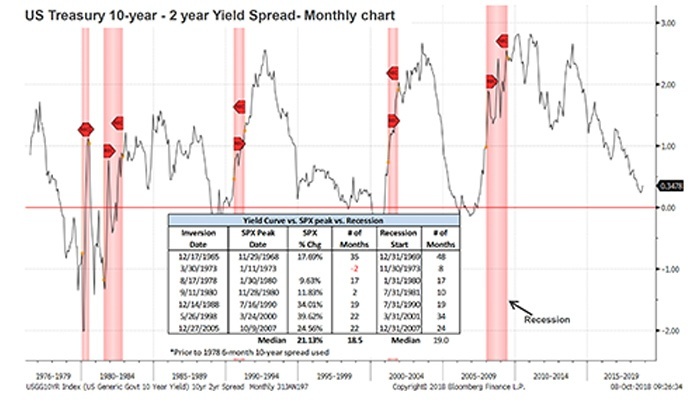 As we have highlighted over recent years, the best indicator for an ultimate recession over the past seven cycles is an inversion of the yield curve. If you look at periods of relatively benign inflation (1960s, 1980s, 1990s, 2000s), the median lead time to recession is 31 months (Figure 1). Recessions start a median of 19 months after the initial U.S. Treasury 2-year/10-year yield-curve inversion, and the yield curve has actually been steepening recently. Fed senior loan officer survey. Each quarter, the Fed asks the banks whether they are “tightening” or “easing” their lending standards. In the most recent survey, they found that despite one of the longest economic expansions in history, banks have eased their lending standards to both small and large businesses (Figure 2), helping fuel capital expenditures (CAPEX). Small-business confidence. The NFIB Small Business Optimism Index (NFIB), which is likely the broadest measure of sentiment among small-business owners, recently made a new cycle and record high (Figure 3). This driver of the U.S. economy and employment has shown significant improvement following the 2016 election and has stayed that way given the fiscal stimulus of deregulation and tax cuts. We found that a peak historically leads recession by a median of 41 months—something to consider if August 2018 proves to be the cycle peak. Manufacturing optimism. The ISM Manufacturing Survey (ISM) has measured sentiment at the manufacturing level since 1950, and August hit a cycle high (Figure 4). 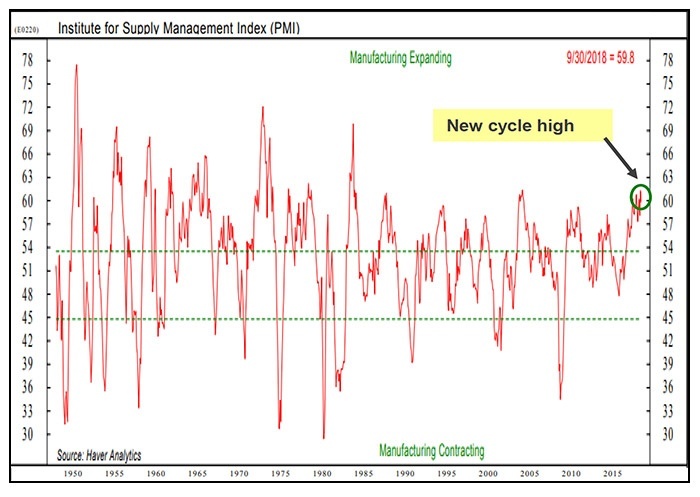 We have found that a cycle peak in the ISM leads recession by 31.5 months. National financial condition indexes. The Chicago Fed has three indexes (risk, credit, and leverage) that compile 105 stress indicators within traditional banking, shadow banking, and the financial markets. Stress happens fast, but not before these factors play out. Over the past 40-plus years, the indexes have been above zero before a recession. All of the indexes are still near historically low stress levels. A positive fundamental backdrop can be interrupted with temporary periods of volatility, and we are partially through one now. We expect further near-term volatility until our four key tactical indicators approach levels that are typically reached near the beginning of the next intermediate-term leg higher. The first signs of an identifiable bottom are a VIX approaching 20 (currently 15), and the percentage of S&P 500 (SPX) components trading above their 10-day moving average dropping below 20% (currently at 33%). We continue to believe the strength in EPS, coupled with strong business and consumer confidence, should cause any market weakness to prove temporary until there is an identifiable recession in sight. Sustainably negative economic periods don’t magically materialize because rates are going up; they are driven by credit stress that leads to a credit crisis strong enough to shut down money availability. History shows this happens more slowly than many believe, as proven by the lead time to recession of the initial inversion of the U.S. Treasury 2-year/10-year yield curve, and the cycle highs of the NFIB Small Business Optimism and ISM Manufacturing surveys.